That's the version we're getting in the UK. In France it's Jo-Wilfred Tsonga, Novak Djokovic and Rafael Nadal. In Spain it's Rafael Nadal, Novak Djokovic and Maria Sharapova. And in Germany it's Roger Federer, Boris Becker and Maria Sharapova. 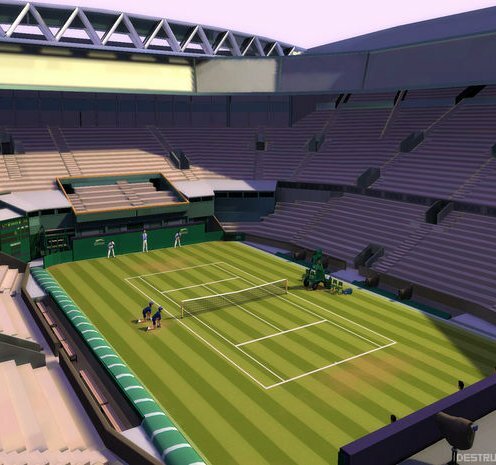 EA Sports has the license for all four Grand Slam tournaments, including Wimbledon. The PlayStation 3 version supports the Move controller. Xbox 360 gamers, however, won't be able to hook up a Kinect unit for a spot of air-slapping. "The successful Kinect titles are built specifically for that platform, " producer Thomas Singleton told Eurogamer back in August when we asked why. "They're not built for that platform [pointing at a PlayStation 3 unit] and then made to work with the Kinect platform. The games that play well, that's where the Move controller is treated as a peripheral versus a platform. We're supporting the peripheral."